For those who are uninitiated in the realm of astrology, this month of October has been chock full of all kinds of surprises which were written in the stars. This Wednesday, October 19, is the day when “Mars conjuncts Pluto”—a truly explosive combination if ever there was one. Those who occupy the very peak of the pinnacle of the pyramid of global power have access to the best practitioners of occult astrology, cabalistic numerology and hermetic freemasonry. As such, the Globalist cabal uses — with great dexterity — these occult sciences and arts in order to time and orchestrate their many intrigues and machinations. Hence, it ought to be understood that Wednesday, October 19th, was specifically chosen because of the powerful and combative energies which favor their destructive agenda. A close look at the “Mars conjunct Pluto” transit will reveal why this day was selected particularly for the third and final debate. It doesn’t get any more “Martian” than this type of transit. However, because Donald Trump is now fully aware of this little astrological factoid, he is able to effectuate a surprising reversal of fortune as only he can do. The following link contains much more background as to why this October will live up to its reputation for surprises. There is simply no stopping them from occurring from now until the 31st, and right up until election day. For those who did not read the preceding link, it explains how this October represents a unique convergence of highly consequential events, any one of which might serve as a Gray Swan. Just one Gray Swan, and there are many flying around the globe at this very moment, is capable of setting off a domino effect the likes of which can completely alter the present planetary civilization. We’re talking about a profound and fundamental transformation of life on Planet Earth. Yes, things are that volatile and dynamic throughout every sphere of life since the very astrological blueprint has ensured this eventuality. The systemic risks, which are the most pronounced at this time, lie in the geopolitical-military realm as well as in the economic- financial sector. The most salient and predictable list of present dangers and obvious risks can be viewed at the link below. It is the inevitable collision of these primal and violent energies that will make this debate so intense and earth-shaking. Because this election cycle is occurring during the Chinese Year of the Red Fire Monkey, there is no question that Donald Trump embodies the forces of the indomitable Fire Monkey. It is well known throughout the East that Lord Hanuman, the quintessential Fire Monkey, cannot be defeated during his auspicious year. As Pluto continues to crash through Capricorn this year, the global institutional arrangements are all under assault. Hence, the 800 Pound Gorilla personified by Hillary Clinton is likewise under massive assault as would be expected. Be aware that it is usually the 800 Pound Gorilla that always sits wherever it wants to. Not so in 2016! The entire Global Economic & Financial Control Matrix is under unprecedented attack as the successful BREXIT graphically illustrates. This is why the outcome of the 3rd debate will be so telling. It’s not that the election winner will be decided, as this November 8th ballot WILL NOT determine who ultimately wins. That outcome will be under great doubt until the very end of the year. The critical point here is that the coming Great Debate will telegraph much about how the final battle of this epochal war will shape up. The Globalists will not go down easy although it is now their destiny to fade into obscurity. The Nationalists are determined not be cheated again, and will see through their constitutional mandate no matter how challenging the obstacles. This historic U.S. presidential election is really not about Donald Trump and Hillary Clinton. On the one hand, it is about the people-powered movement led by Donald Trump that is now an inexorable force which TPTB must deal with. Trump could quit tomorrow and the movement would still continue to gather considerable momentum. This is precisely what 2016 is all about, just as 1776 was a revolutionary year with the signing of the Declaration of Independence. Similarly, this clash of ideals and political philosophies is also about the entrenched NWO ruling elites who have had this planet under lockdown for millennia. Their power and influence are now waning by the day, and is perfectly reflected by the very feeble and ailing Hillary Clinton who can barely make it to the campaign events much less stand for an hour and a half debate. Even Trump has called for drug testing since she MUST be pumped up to weather such demanding debate conditions … given her true health status. The real bottom line here is that even the final election outcome will not determine what one might think will transpire across the USA over the next 4 years. That’s because no matter who is elected, the opposite side will attempt to spoil the victory. In the case of the Trumpsters, they know that Clinton must steal this election to win; whereas the Clintonistas will simply not permit a Trump victory no matter what the legitimate poll result dictates. This is why the Globalists have been so very busy rigging every aspect of the electoral process to ensure a fraudulent Clinton success. October 19th will certainly not bring any finality to the cascading events which are now unfolding at a meteoric pace. On the contrary, the energies of this month will serve to significantly amplify the revolutionary fervor which already predominates across America and the world-at-large. In such a maelstrom of dissent and discord will those who are not on the right side of history eventually come to regret their alignment with the Globalists. 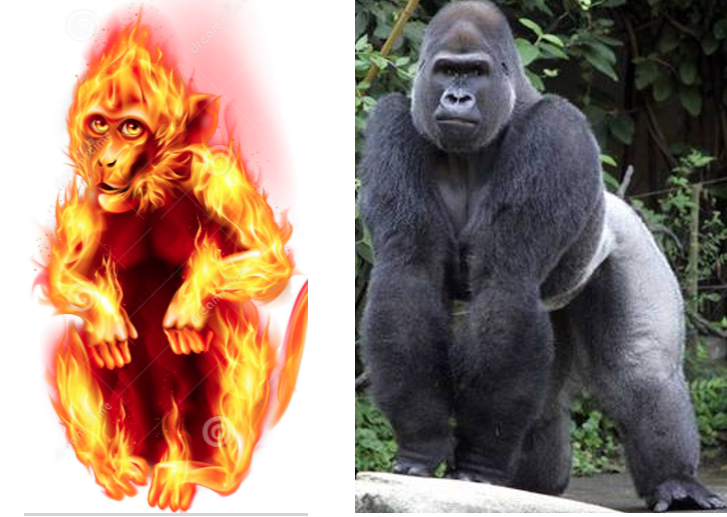 Not only has the year of the Super Shemitah recently come to an end, the Fire Monkey has only now begun to reveal himself. No matter how big or powerful the 800 Pound Gorilla thinks she is, the perfect foil was always set up to be the invincible Fire Monkey. Therefore, it is best for anyone, who has yet to commit themselves to a side in this epochal conflict for the soul of humanity, to join the people against the governments and those who control them. As long as globalism is allowed to run amuck around the world, there will be no peace. That’s because there can be no justice wherever the NWO Globalists have set up shop through their divide and conquer MO. The USA is now experiencing the very worst of this divide and rule strategy, for it has been used to profoundly undermine the American Republic under Barack Obama. It has especially been utilized to entangle the United States in many unprovoked wars of aggression, even conflicts which are started specifically to elect the globalist Clintons. Obama is merely the most recent in a long line of petty tyrants who were selected to destroy what the Founding Fathers so providentially created. Not only was he chosen to prepare the nation for World War III, he was ordered to pass the warmongering baton to Hillary Clinton. For it is always U.S. Presidents from the Democratic Party who set the stage and prosecute the World Wars. World War I occurred on the watch of Democrat Woodrow Wilson, just as World War II took place during the presidency of Democrat Franklin Delano Roosevelt. It’s entirely true that the momentous upcoming election is a defining moment in U.S. history. The sheer desperation exhibited by the now constant MSM propaganda and DNC dirty tricks is a dead giveaway. The Globalists have everything to lose; the Nationalists have everything to gain. Therefore, it has never been more important for each citizen to put their stock the US Constitution and those who clearly support it. A failure to do so at this critical juncture may mark a turning point that can never be reversed. Barack Obama and Hillary Clinton were both chosen and groomed over the course of their lives to advance the NWO globalist agenda. Both have served their masters at the great expense of the American people. Each of them has carried out his/her responsibilities in a treasonous manner. Hence, there can be no place in this nation for traitors. They must be arrested, tried, and sentenced harshly as only traitors must be punished. Remember, Obama was tasked with setting the stage for the hot phase of World War III, while Hillary Clinton has been given orders to prosecute it. The blueprint for WW3 is central to the Globalist agenda to produce their misguided New World Order out of the resulting chaos. Ordo ab Chao has always been their primary strategy by which to fabricate a One World Government. The Democratic Party is now being used just as the communist Bolsheviks were employed to incite the Russian Revolution. The DEMs have been utilizing the very same violent tactics and disruptive strategies throughout this campaign season. This unparalleled political phenomenon has no precedent in American election history and will only intensify unless the Nationalists take back their power—post haste! Previous articleTREASON: Who Did 9/11 And Why Did They Do It?